The hot new low carb substitute for mashed potatoes is cauliflower. Cauliflower mash is buttery, creamy and delicious plus you can hardly tell that it’s not mashed potatoes especially if you’re trying to fool fussy eaters. Since cauliflower has come down in price from over $6 a head down to a reasonable $2.99 each or 2/$5.00 it’s worth experimenting once again. One of my favourite cauliflower recipes is my baked cauliflower with cheese as a side dish to roast beef or any other protein. Cauliflower mashed potatoes (there is nothing potato about this recipe but some people need to call it mashed potatoes to help describe what it is that you will be eating). How long should you boil the cauliflower? I make sure to chop my cauliflower into small florets so they cook faster. You’re going to mash it all up anyways so it doesn’t really matter at this point. The key is to keep the cooking time down which you can pull off in about 20 minutes on high heat so the cauliflower is at a rolling boil. Make sure to keep an eye on the cauliflower so that it doesn’t boil over. I use the wooden stick method and set it across the pot to keep it from boiling over. It really does work, try it. Here’s a quick tip for you: I used to go a bit mad trying to cut into a cauliflower but I no longer fear this round bouquet of florets because I simply smash the cauliflower on the cutting board. Each time I hit it more and more of the cauliflower falls apart which makes for a simple chop fest. I fill a pot of salted water and add the cauliflower then bring it to a boil. Once the cauliflower is fork tender I drain the water and put the pot back on the hotplate while it’ still a bit hot so some of the water will evaporate. Cauliflower is naturally watery so it will be tough to get rid of all the moisture but it helps to make a thicker cauliflower mash. 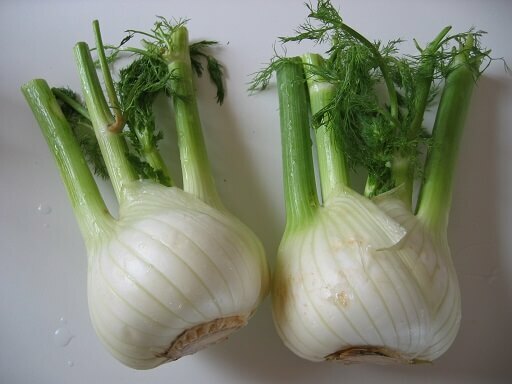 Several cultivars of Florence fennel are also known by several other names, notably the Italian name finocchio. In North American supermarkets, it is often mislabeled as “anise”. These are the greens at the top of the fennel that look like dill and can be used in cooking and even to make flavoured tea. I used the greens as flavouring in the cauliflower mash and sliced some of the fennel bulb to use in place of traditional celery. How can you use fennel greens? The bulb, foliage, and seeds of the fennel plant are used in many of the culinary traditions of the world. The small flowers of wild fennel (known as fennel “pollen”) are the most potent form of fennel, but also the most expensive. Dried fennel seed is an aromatic, anise-flavored spice, brown or green in color when fresh, slowly turning a dull grey as the seed ages. For cooking, green seeds are optimal. The leaves are delicately flavored and similar in shape to those of dill. The bulb is a crisp vegetable that can be sautéed, stewed, braised, grilled, or eaten raw. Young tender leaves are used for garnishes, as a salad, to add flavor to salads, to flavor sauces to be served with puddings, and also in soups and fish sauce. Fennel seeds are sometimes confused with those of anise, which are similar in taste and appearance, though smaller. Fennel is also used as a flavoring in some natural toothpastes. The seeds are used in cookery and sweet desserts. (source) Wikipedia- Fennel where you can read more about fennel and it’s uses. To the boiled cauliflower I add a pinch of salt, fresh cracked black pepper, 2 tablespoons of butter, 2 tablespoons of cream cheese, 1/2 cup of fennel greens (the leafy greens at the top of the fennel if your store did not cut them off) and a swish of cream and then I mash. Cauliflower mash is simply delicious and perfect for this cauliflower mash cottage pie recipe. Once the mash is done it’s time to get going on the cottage pie mince filling which is also very easy to make. In a skillet add a tablespoon or two of butter to melt on medium heat. Once melted add the minced onions, radishes and fennel. You can add chopped mushrooms or any other vegetables you like as long as they are low carb or fall with-in your macros for the day. If you’re not worried about low carb add whatever vegetables you like. If you think that radishes sound disgusting in the cauliflower mash cottage pie don’t be. They taste just like boiled potatoes once the cottage pie is cooked and ready to eat. Even I was skeptical but it’s true…you’ll see! Once the vegetables are coated in butter and starting to cook up a bit I add in a tablespoon of tomato puree, 1/2 cup of beef broth, 1 cup of fennel greens chopped, all spices and one pound of Angus minced beef. Once this cooks up you will be ready to put your cauliflower mash cottage pie together. I used a 9×11 white baking dish which I sprayed with cooking spray. I added in all the cottage pie mixture to the bottom of the dish. I then topped it with cauliflower mash and 3 strips of thick slicked cooked bacon. Wrap the cauliflower mash cottage pie in tin foil then bake in the oven for 1 hour on 350 degrees. Remove from the oven and top with a cup of mozzarella and old cheddar and put it back into the oven on broil for 5 minutes until the top is golden brown. I like to let the cauliflower mash cottage pie sit for at least 30 minutes so it can cool down and make it easier to serve up. If you serve it straight from the oven you’ll never get a perfect piece and it will just be a mushy mess. I’d still eat it but it’s not that appealing when serving this to guests. The cauliflower will give off lots of moisture so you will have lots of gravy broth underneath once you take the first piece out. If you want to make homemade gravy just throw a beef bouillon cube in 1.5 cups of water and bring to a boil then add 1 tablespoon of flour to hot water and stir to get any lumps out. Add the flour mixture to the beef broth and stir until it thickens. Voila, you have beef gravy. My wife didn’t have any gravy on her cauliflower mash cottage pie but she did add a bit of Franks Red Hot Sauce and a drizzle of Ranch dressing both of which are Atkins friendly. She served a slice of the cauliflower mash cottage pie with a side spinach salad. That’s how easy it is to make cauliflower mash cottage pie for dinner. It takes about 1.5 hours from start to finish so you can easily make this after work and still have it on the table for dinner. Although we didn’t take photos of the process to make this cauliflower mash cottage pie recipe I can assure you that it was easy and the clean-up was not time-consuming at all. 25.25g Total Net Carbs for the entire cottage pie which means just over 3 carbs per serving. 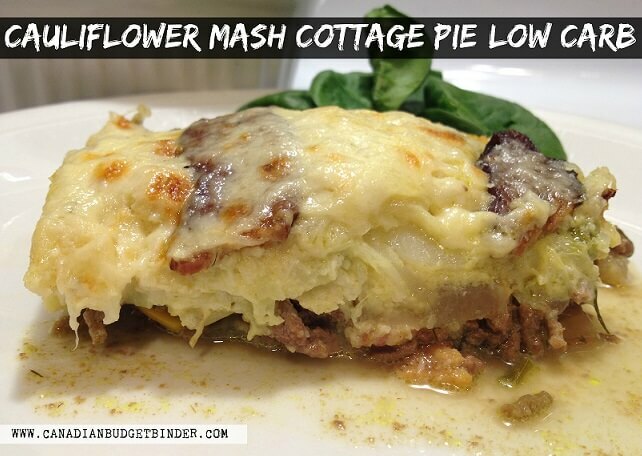 Low carb cauliflower mash cottage pie is a healthy alternative for the traditional cottage pie recipe and so good. The best part is how easy it was to make and how easy it was to eat. In a large pot add cold water with a teaspoon of salt bring your cauliflower florets to a boil and cook until tender. Remove from heat and drain the water. Put back the cauliflower into the pot and back on the stove to dry off some of the moisture. Top that with a few strips of cooked bacon and bake for 1 hour in a 350 degree oven or until golden brown and bubbly. Remove from the oven and then add the cheese topping. Put the oven on broil and put back the cauliflower mash cottage pie into the oven to brown. Let the cauliflower mash cottage pie sit for at least 10-15 minutes so it's easier to cut the squares for dinner or travelling. You don’t have to be on a low carb diet to enjoy this cauliflower mash cottage pie. As long as you are open to trying new ways of making traditional meals healthier it’s worth enjoying them too. Do you make cauliflower mash? Looks like a great recipe. Never mentions adding the spices or what temp. to bake. Thanks Kevin for catching that and letting me know. I’ve added 350 degrees and the spices into the recipe. 🙂 I hope you like it. Stay tuned for a Spinach, Ricotta Turkey and Ham Casserole (Low Carb) it’s amazing! I always love these cauliflower dishes because they can taste really good and are very light on carbs. This one looks like a winner that we will have to give a try. It is a winner Derek. I was skeptical as it’s my wife who loves low carb but this is a winner. This does look good!! Wonder what I can replace the fennel with as we are not a fan of it here. 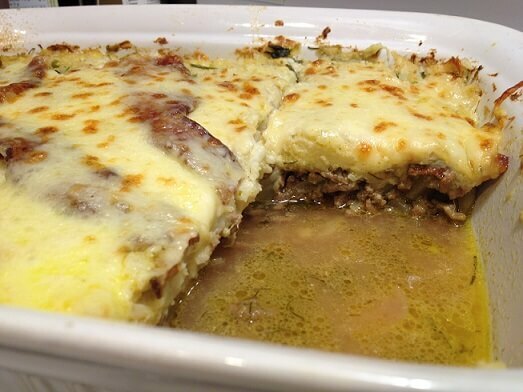 My shepherds pie here is a clean up of roast leftovers so it is quick and easy.